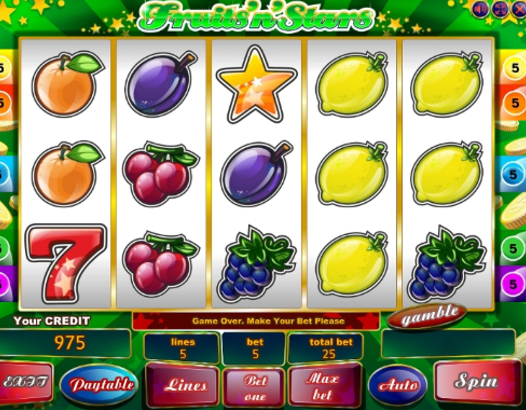 Fruits n Stars is as simple as it gets in terms of online slots. Encompassing a vibrant aesthetic, coupled with that constantly successful fruit machine adage, Fruits n Stars is a slot game that simply can’t make mistakes. People will continue to play these games no matter what. Match up the fruity symbols, and the bars and sevens to earn some cash prizes and free spin bonuses. The developers at Playson aren’t afraid to experiment with their slot games, in order to come out with some of the most exciting themes and gameplays. Though thoroughly innovative, they can also stick to the classic slot experience quite well, and even improve it with appropriate graphics and exciting features. 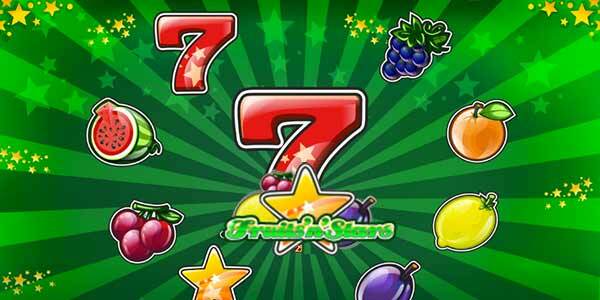 Fruits n’ Stars is an example of that, as it has a retro casino slots style, yet it impressed with the modern touch. There are lots more Playson games available at slot games. Fruits are some of the most popular symbols in the casino industry, both online and in real life, and this game has plenty of them to offer, as you could tell from its name. There are also several shiny stars to bring excitement and variation to the theme, while also keeping it classic. And we couldn’t forget the Lucky Seven symbol, always present and ready to offer big prizes. The graphics are minimalistic, but the colours are vibrant, which makes the whole design stand out in the best way. You won’t be delighted by a complex theme, but rather by the simplicity and energy Fruits n’ Stars has to offer. This slot game has 5 reels and 5 paylines, so you won’t get a headache from all the possible combinations. Lovers of the simpler casino times will love this aspect. The background features bright stars and lots of coins, so not even for one second will you lose sight of the goals you’ve set. And the opportunities to win are indeed big. The funky music will have you moving in your seat to the rhythm, while the whole mood of the game is celebratory for all your future wins. The bets you can place range from 0.25 credits to 50.00 credits, and there is also an Auto-spin option, with up to 100 spins, so you won’t have to do any work at all. The gameplay is as simple as they get, with no Bonus Features or Free Spins, which might put some players off. But if you’re here for the experience, not for the bonuses, you will have no problem enjoying yourself. The Star symbols have the special ability to be paid independently of the bet lines selected, so you won’t have to worry about them, but rather only watch them shine. The Lucky Seven symbol is the more sought after, because it has the highest value. If you spin 3 of them on an active payline, you get 1000 credits, while 4 of them reward you with 10000 credits, and the big jackpot of 50 000 credits comes once you spin 5 Lucky Seven symbols. That must sound tempting! The fruits also pay well, with the watermelon and grapes paying up to 5000 credits, and the plumb, orange, lemon and cherries paying up to 2000 credits. While Fruits n’ Stars lacks the Wilds, Free Spins and other Bonuses, it make up with an energetic, upbeat atmosphere, sleek graphics and a classic theme that will remind you of the retro casino machines, while still maintaining a modern touch. The perfect combination! Now check out our Diamond Deal slot.